Universal power input of 100-240Vac, 60W maximum. Requires two USB channels, and Windows XP-SP3, WIN7, WIN8, or WIN10. Compatible with touchscreen and laptop PCs. Weight: 13 lbs (5.9 kG), Size: 12.5" wide, 18.5" deep, 3" high. Includes one-year RENEWABLE warranty with one year free tech support and software upgrades. 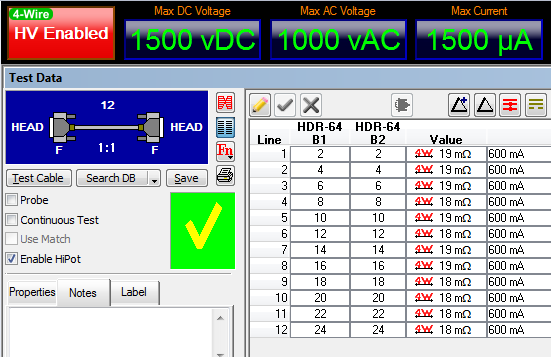 The HVX Expansion Module (item 828) adds 128 test points to a CableEye HVX series system. 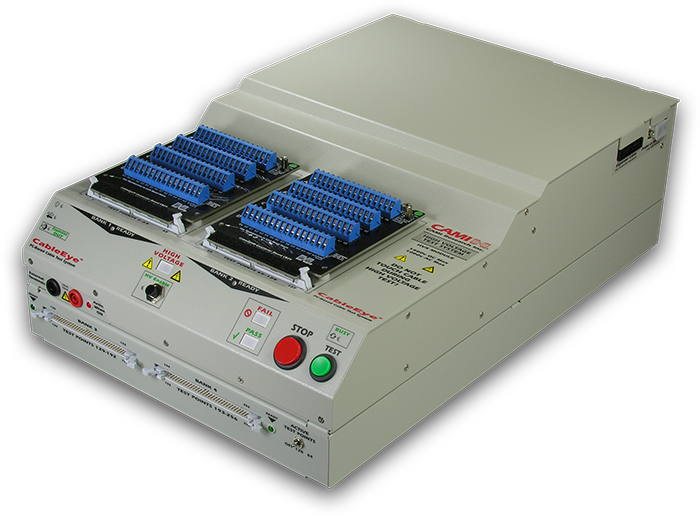 Up to 7 expansion modules can be connected for a total of 1024 test points, including the HVX system. This unit has two 64-pin header connectors that can be used with our QuickMount Housing (item 712). You can also connect them directly to your fixture using 64-conductor flat cables. Dummy plug (included) is required for normal control. Replace dummy plug with external cable leading to your own controls when remote is used. Matching connector identical to that shown for dummy plug is included with this option for wiring to your remote cable. Adds expanded testing for contact and wire resistance as low as 1 mΩ. After checking for opens, shorts, miswires, and resistance limits, the 4-wire Kelvin measurement applies a user-selectable test current from 100 mA to 1 A to determine connection resistance within 1 mΩ. The resistance profile of a model cable may be stored and used as a basis of comparison during later testing to reveal cold solder joints, faulty crimps, recessed pins, pin contact contamination, improper wire gauge, and stress-extruded wire. 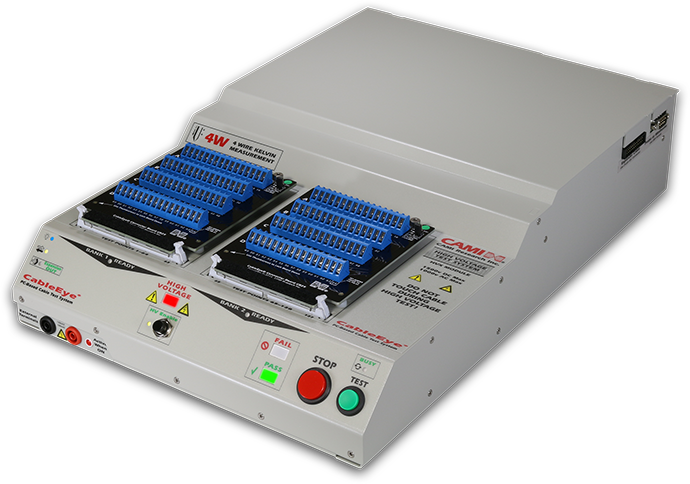 Four-wire measurement eliminates any effect of fixture resistance to obtain a precise value of the unit under test (UUT) resistance only. The same high-accuracy measurement may be obtained with a short fixture attached directly to the tester, or with a large wire harness fixture that may extend a considerable distance to reach the UUT. Users may optionally set up a high-current stress test for wiring by driving up to 1 A of current through each conductor, and setting a dwell time from 100ms to 3 minutes. Increasing resistance during the dwell period may show problems not detected with a shorter measurement interval. Individual conductors within a UUT may be independently disabled from 4-wire or high voltage test by user selection to avoid potential damage to fuses or other sensitive components. 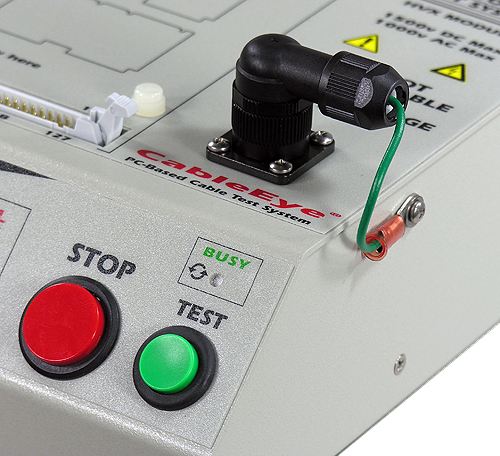 Users may also independently set different test currents for each conductor. Existing CableEye users may upgrade their HVX series testers by purchasing just the 4-wire expansion.